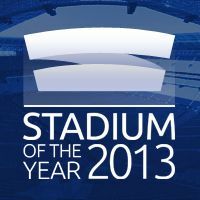 Stadium of the Year 2013: Let the vote begin! As was the exactly one year ago, we invite you to take part in our annual Stadium of the Year competition. We collected over 80 submissions from you during the nomination period and the result is the final list of 18 stadiums opened last year. Now time has come to cast your vote. Each user has 15 points to spread among 5 best-regarded stadiums from the list. Notes of 5, 4, 3, 2 and 1 point can be given to one stadium each, 5 for best and 1 for 5th best stadium. Everyone can cast their vote only once, so take your time to browse through photos, descriptions and presentations. StadiumDB.com provides all the materials needed to make the selection possible. The vote lasts until and including February 22, so there's plenty of time. As the vote ends, we won't keep you waiting long and present the winner on Feb 24. Thanks to your amazing participation last year Stadium of the Year is now the world's largest open vote of its kind, celebrating the very best football stadiums. Previous winners are Aviva Stadium (Ireland), PGE Arena Gdansk (Poland) and Arena do Gremio (Brazil). Which stadium will join these three? We'll know in one month, so get to voting!